The network is shown with two hidden layers. Some authors prefer to show a B-spline network with only one hidden layer. For a proper understanding of multi-dimensional B-spline networks we prefer to show the network with two hidden layers. 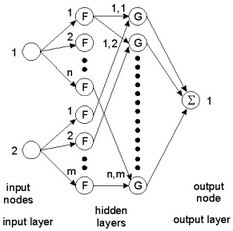 The first hidden layer distributes the inputs over several nodes. In the figure above input 1 is distributed over n nodes. Each node of this layer has only one input. To this input a "basis function" F is applied. As basis functions, B-splines are used of any desired order. An N-th order B-spline function consists of pieces of (N-1)th order polynomials, such that the resulting function is (N-1) times differentiable. 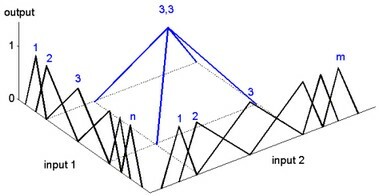 The figure below shows examples of B-spline functions of different order. A spline function differs from zero on a finite interval. The output node sums the results of all second hidden layer nodes. When the spline functions of the various nodes are properly spaced, every one dimensional function can be approximated. 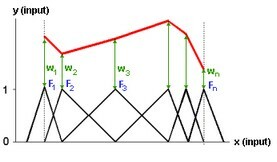 This is shown in the figure below where the various splines (F1 to Fn) combined with the various weights (w1 to wn), together form an output function. 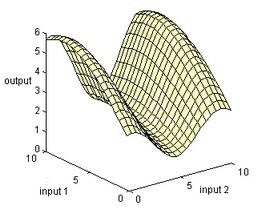 Two-dimensional B-spline networks have two input nodes. The first hidden layer, as with the one-dimensional network, consists of nodes, to which a basis function F is applied. This is shown in the figure below. To the first input a group of n nodes are applied, and to the second input a group of m nodes are applied. Again the output node sums the results of all second hidden layer nodes. When the spline functions of the various nodes are properly spaced, every two dimensional function can be approximated. The figure below shows the spacing of various spline functions of the two inputs and one output of a node of the second hidden layer. The output node sums the results of all second hidden layer nodes. When the spline functions of the various nodes are properly spaced, every two dimensional function can be approximated. This is shown in the figure below. In a same way more dimensional B-spline networks can be created, using more inputs. The 20-sim B-spline Editor supports networks with up to 256 inputs and one output. The B-spline network is trained by adapting the weights. During training the network output is compared with a desired output. The error between these two signals is used to adapt the weights. This rate of adaptation is controlled by the learning rate. A high learning rate will make the network adapt its weights quickly, but will make it potentially unstable. Setting the learning rate to zero, will make the network keep its weights constant. Learning of B-spline networks can either be done after each sample (learn at each sample), or after series of samples (learn after leaving spline). Given a certain input (x), only a limited number of splines Fi (x) are nonzero. Therefore only a few weights are adapted each sample. Here n is the number of samples that have been taken.